A sweet brindle coloured Pitbull, sits patiently at the feet of his owner. The whole scene in the photograph has been carefully decorated to resemble a wintery outdoor view - with a snow scene on the painted studio backdrop, a thick wool material on the ground (or perhaps pale sand?) 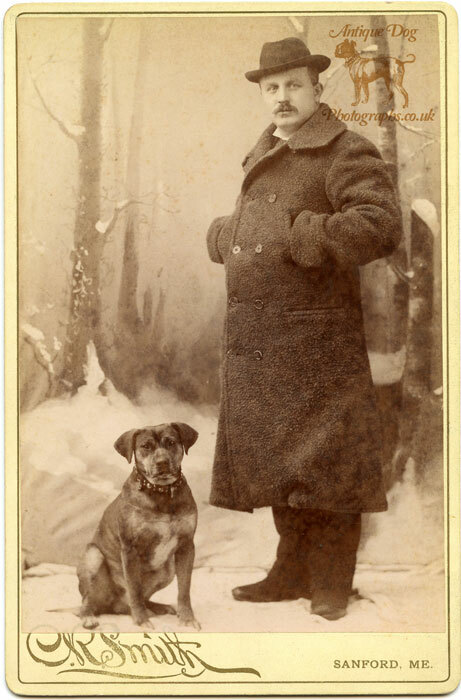 laid to resemble snow, and the gentleman posed wearing a thick winter coat. 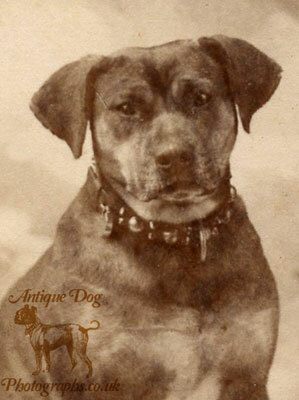 The dog wears an elaborate leather collar, with round studs alternated with pairs of small pointy studs and a big ring at the front. If you look carefully to the left hand side you can see a little padlock which fastens the collar closed. This photograph was taken in Sanford, Maine, USA by C. R. Smith. It has been difficult to find anything out about this studio. Searching through the 1900 & 1910 US Federal Census records, the only likely candidates for the identity of C. R. Smith in Sandford, is Celia R Smith, wife of William E Smith, house painter. If anyone does have any more information on the Studio of C. R. Smith I would love to hear it (click on the census image below for a larger view). Source Citation: Year: 1910; Census Place: Sanford, York, Maine; Roll: T624_548; Page: 3A; Enumeration District: 0262; FHL microfilm: 1374561.